Metro Manila roads do feel like the Wild West most of the time. It can be pretty damned scary, lawless, and you half expect the driver next to you to just pull out a gun and shoot someone. This can be compounded by the fact that traffic deputies can’t seem to enforce road rules. Ever got pulled over and not even know why you’re being pulled over except that it’s merienda time? There are even times when you don’t even know if the guys waving at you are legitimate traffic enforcers. Personally, I’ve seen myself pulled over by city enforcers with nary an identification or even a name patch to show. And now with the Tokhang scandal, it has gotten exponentially scarier. What’s unclear is if this means that the HPG and MMDA. How about local city or municipality enforcers? Shouldn’t they get IDs too or they’re free to accost any suspected traffic violator? And how would we know if the IDs themselves are real? The LTO said that there are security features. The LTO should also launch an information campaign for the public to be able to tell if the identification is legitimate or not. 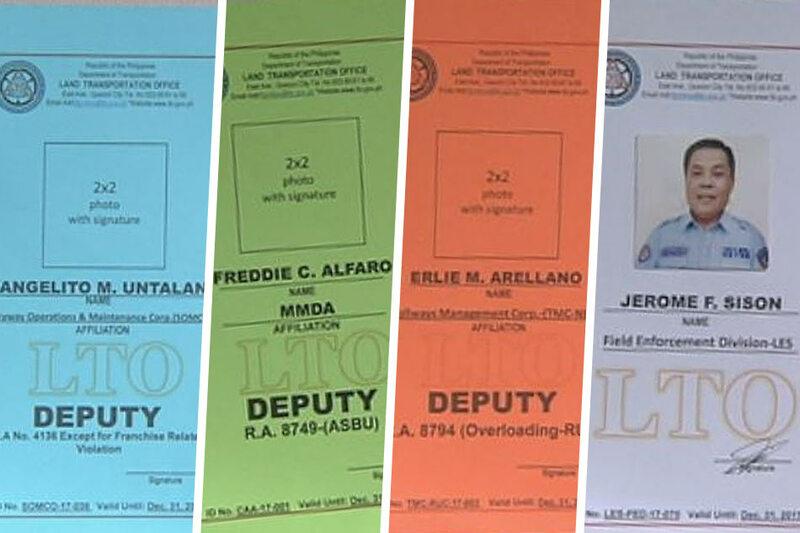 Based on just the photos, the IDs look like they can be replicated using cartolina, a printer, and lamination machine.